Hajdu, Kálmán Day. Photo: Látókép Ensemble. 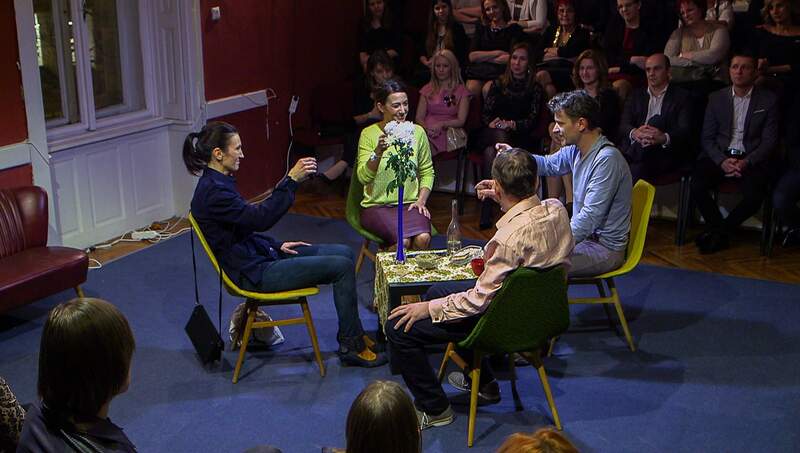 There is a new tendency in Hungarian theatre for reinterpreting the notion of psychological realism and, at the same time, offering a new perspective on the good old topic of bourgeois drama: “family”. There is no age, as Erika Fischer-Lichte has pointed out, which admired the institution of family as much as the age of bourgeoisie. The innovation of psychological realism basically lies in the fact that today we have a different interpretation and sensation about the natural than that of the audience at Ibsen’s time. The difference not only has to do with the fact that we can always feel the artificiality of the historical setting (prescribed in great detail in the Ibsenian set directives), but also because bourgeois public theatres today–often with a large audience–make real, life-like acting (volume, gestures, mimics, intonation) impossible. So with the intention of a naturalistic effect, it makes sense to move into a much smaller venue. That is the concept behind several contemporary works–for instance, those by Tamás Ördög and his company (called Children of Dollar Daddy) that usually work in small, and almost always empty spaces. Also, working as a collective, they basically rewrite together each line (usually of northern European authors like Ibsen and Strindberg) during the rehearsal period, in order to get a more spontaneous effect. So the company has found its self-reflexive way to continue and innovate within a naturalistic theatrical tradition. The roots of this innovatory tradition in the Hungarian theatre date back to the Seagull (2003) by Árpád Schilling, a show performed in an empty space, with performers acting in a seemingly every-day like tone. Yet these works by Children of Dollar Daddy–along with those of Ibsen or Strindberg–do not exceed the paradigm of criticizing the unproblematic notion of family or marriage. They turn towards the topic of institutionalized relationships with the same critical attitude (life-lie) that Ibsen’s plays treated the nostalgia of the nineteenth-century bourgeoisie for the long gone idyll they attributed to the bourgeois family life. In comparison, the theatre of Szabolcs Hajdu (Látókép Enseble) invented a completely new attitude toward the representation of family and relationships. First of all, it is an auteur theatre (most of the text is written by Hajdu himself with the aid of Orsolya Török-Illyés based on improvisations and discussions with the actors); yet–as in case of The Children of Dollar Daddy–it also seems like a collective work. They equally follow and rewrite the new tradition of psychological realism or even hyperrealism. Most important of all, the collective has found an authentic language that enables them to deal with the seemingly banal, domestic topics of bourgeois drama, such as the conflicts in a marriage caused by midlife crises. Yet it is a question whether we can call this theatre bourgeois any more. 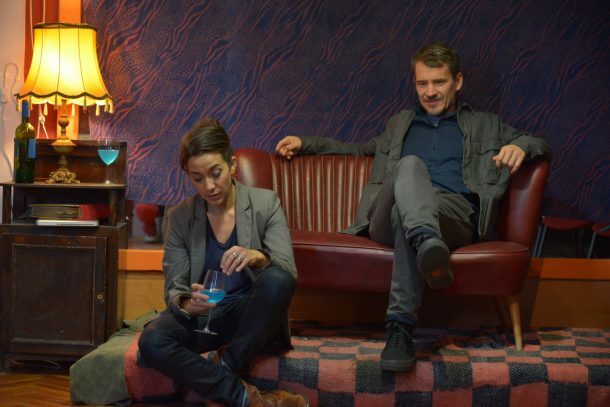 These characters live in a bourgeois home (originally one of Hajdu’s shows was actually staged in a bourgeois flat), but these characters only rent it. In addition, they represent a much more typical social layer in Hungary than the bourgeoisie: the plunging middle class. Hajdu, It’s Not the Time of My Life (film). Photo: Látókép Ensemble. We are talking about a theatrical series here: the title of the first one is It’s Not the Time of My Life (2016); this is the original theatrical version of the film that won the Crystal Globe for best film and for which Hajdu received the award for best actor in 2016 at the Karlovy Vary International Film Festival. The title of the second part is Kálmán Day (2017), a show that is connected to the first show in several ways and which equally rewrites the concept of bourgeois illusory-theatrical performance and the conversational play. Thus it seems logical to talk about the two shows as a series, which combine stylized and hyperrealistic elements at the same time. For instance in It’s Not the Time of My Life the characters of the kids are played by an evidently middle-aged performer. This is a classic example of the man dressed as a kid for archetypical comic effect. Moreover, some of the sensual scenes are also depicted only in pictures, bridging the problem of verbalizing such moments (for instance when the kid takes control of his dad, moving and directing him, like a marionette puppet with invisible strings). So it is evident that–as opposed to the filmography of Szabolcs Hajdu–his theatre is many times more stylized. The combination of hyperrealistic, film-like segments with the stylized language is one of the key means by which this theatre can reinterpret the typical attitude toward attachment and institutionalized relationships. The common ground for these two factors is self-irony, since this self-reflexive attitude helps to prevent the tone from becoming too melodramatic. I haven’t yet seen in theatre such a unique way for authentically portraying the beauty of such seemingly banal problems as the suffering of a midlife crisis, while at the same time depicting the small problems of a long marriage without the result becoming either too banal or too narrow. Talking about artistic attitudes, the former head of the Hungarian Theatre Critics’ Association, Andrea Tompa, compared this theatrical language to that of Alvis Hermanis. That comparison relates a sketch where the couples on the verge of divorce and after long years of mutual life simply dance together without uttering a word. This scene is much like an apotheosis for the human being in spite of all the fallacies or petty crimes committed in the relationships. Maybe it sounds strange to say that any kind of theatre that deals with the topic of the bourgeois drama can be experimental, since the so-called bourgeois audience expects solid frames and calculability. Yet these two shows seem to rescue the topic of family both from the unreflexive nostalgia towards the bourgeois idyll, and at the same time from an exclusive critical attitude and suspiciousness towards the concept of balanced family life. The elements of the reinterpretation start with a myth around the artistic group. In fact, it is not unsuitable that the protagonist is both times played by the director himself. Hajdu is famous in Hungary for the fact he shot a guerilla film from the theatrical version of the It’s Not the Time of My Life. The reason behind this gesture was that he is reluctant to participate in state funding in contemporary Hungary. Also his theatre follows an unusual business model for the very same reason. That is why he was dependent upon the venues of the Hungarian counterculture before the regime shift in 1989: theatres in private apartments and hyper-chamber venues; such spaces unavoidably hold an appositional tone in a post-socialist state. 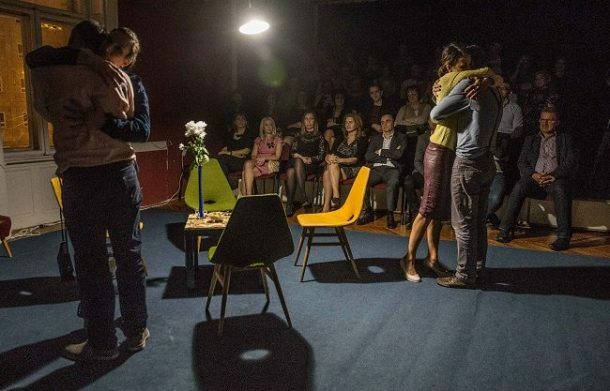 While It’s Not the Time of My Life was originally presented in a bourgeois home that the locals rented according to the fictional story, Kálmán Day takes place in a venue suggesting chamber theatre. Of course in Hungary the bourgeois home (in this case, a sublet) is clearly the symbol of counterculture, the microclimate, the lifeword (Habermas) that is independent of the (official) system. Thus even the theatrical venue itself symbolizes the longing for independence that is in the air among the intellectuals of contemporary Hungary. Most probably the public also knows that the woman playing the wife of Hajdu’s character in each of these shows (Orsolya Török-Illyés) is also his wife in the real world. And the other two returning guest artists, Imre Gelányi and Domokos Szabó, are also known to be the friends of the director, from his hometown, Debrecen, a town in east Hungary. Yet the key point is that this private mythology is treated by the two shows in a highly self-reflective and self-ironic way. Hajdu is ironizing over his very own archetypal commedia dell’arte character, suggesting that the character he plays is not very far from his very own personality. It is a guy who is successful in his marriage–as opposed to the other couples in both of the shows–and a guy who is a heroic nonconformist, revolting against the system from a more or less safe financial background. The Hajdu-Török-Illyés couple present themselves on stage a little bit impishly self-pompous, as oppositional freethinkers, whose marriage in each of the two cases is in a better condition than that of the other couples. There’s some accomplice winking in this situation, a sort of self-irony: we are better than others–they convey–or aren’t we? Or is it only that we would like to be? So this is how the character of the theatre director himself is played with, by ironizing over the original macho role of the theatre director–a role, still very typical among Hungarian theatre directors. The two shows by Hajdu consider the topic of midlife crisis via the perspective of a macho man, and represent easy conflicts between two intellectuals from a good neighborhood. To dramatize the dilemma of leaving a marriage–whether due to a midlife crisis or not–and to conclude this dilemma with a happy ending (the couples finally seem to stay together in both of the cases) is difficult to represent in the Hollywood era. How can one not make it too pink and fluffy? The question of Hajdu’s theatre is how to represent the dilemma without falling into either of the two traps: nostalgia or exclusive criticism. Yet Hajdu can avoid the Hollywood-feeling without falling back to the constant criticism of the life-lie-narrative of the Ibsenian drama, where the only authentic choice almost always seems to be discarding safety. Yet, It’s Not the Time of My Life presents the challenge of staying together in an attractive manner. It appreciates the prosaic love of a long married couple–a feeling most of the romantic poets are disgruntled about. The point exactly is that the honor–traditionally only connected to romantic love (at the beginning of a relationship)–is now dedicated to a phase of the relationship that is usually portrayed on stage, and also in poetry, as gray and disappointing. Even the first show (It’s Not the Time of My Life) starts with an apparent failure. A three member family with a kid returns to Hungary from an emigration that fell through. We can presume that their former motivation to leave a corrupt country was for better opportunities, yet we see how it didn’t work out. However, in looking closer it turns out that the should I stay or go dilemma is used as a frame here; the same dilemma also appears in the relationship of the couple itself. In fact, the relationship dilemmas appear to be the burlesque version of the very same political questions–the strange feeling when you change a country of residence, and the strange feeling when you change a relationship. It’s Not the Time of My Life is above all about our inner strangeness–felt maybe even at home in Hungary, not only upon moving abroad. And via this strangeness the show can depict the dilemma of leaving the feudal Hungary–more and more approaching a dictatorship–and in its burlesque tone equally can depict the dilemma of leaving a relationship suffering from a midlife crises. We can only guess why the couple (who returns to Hungary from abroad) stays with their relatives. Relatives are the closest ones, in a sense, yet they are also usually too distant for a long-term apartment-sharing. The nonsense visit of the relatives–the guest who stays and refuses to go home–which lasts for an ambiguous, seemingly endless time, is the legendary topic of Luis Buñuel. And now it takes place in a country with a socialist past and with the history of rational apartment-utilization. The problem of how to stay, the self-soil-bounding of the Hungarian citizen, also has appeared in a classic Hungarian film by Péter Gothár, Time Stops (Megáll az idő, 1981). The line, “Ok, so we are going to live here” is a saying in Hungary most of the people know. It sounds like an inexplicable course, which is represented in each generation of film one after another, so that all of them stay in Hungary for some irrational reason. Is it because they are afraid of the unknown, even more than the predictable nature of the homely dictatorship? Or is it an inexplicable affection towards loved ones that makes them stay, even despite the feeling of strangeness can be felt at home, too? In any case, watching Hajdu’s self-ironic shows on relationships and midlife crises, one has the feeling that the shows can both endorse the idea of staying together in a marriage without falling into the trap of looking bigoted or false. So far, Szabolcs Hajdu’s theatre appears to be a unique example in Hungary of being authentically present in a seemingly anachronistic choice: staying. And this is true no matter whether it is about the compulsion of being trapped in the homeland, or staying in the banal and formal institution of marriage. Noémi Herczog (1986, Budapest) is a critic, editor, essayist. She is a theatre columnist of the cultural-political weekly Élet és Irodalom (Life and Literature), editor of theatre magazine, SZÍNHÁZ (Theatre), and a theatrical book series (SzínText), and curator of underground theatrical projects. She teaches performance analysis and theatre criticism, and is a doctoral student at the University of Theatre and Film, Budapest. Her research field is the history of denouncing theatre criticism in Hungary.